Art is in my DNA; I see art everywhere I look. Objects, nature, and the ideas that come from my daily experiences inspire me. The link between the things I see and hear and the journey my mind takes with them is what helps me create, and art fulfills my need to express these ideas. I love working with found objects; the idea of repurposing and reinventing the original intention of an object is something I love. To me art is not as complicated as some people make it out to be; it is a very personal thing, like how it makes you feel. If you love the way it makes you feel, it's worth collecting. Art is a journey, an ever-evolving process, I never know where it will take me next and I love that. 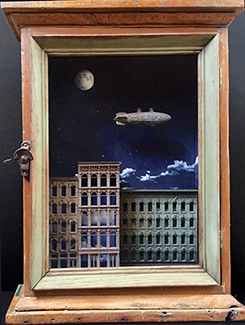 Victoria Roberts, a Los Angeles native living in Albuquerque, New Mexico, has worked professionally in a variety of arts including animation, graphic art, wood and ceramic sculpture, and mixed media assemblage. She was brought up in an artistic family. Her father, who was an artist and animator, was devoted to nurturing his children’s artistic abilities. Attending Sir John Cass Art College in London, Victoria learned the foundations of art such as life drawing, printmaking, still life drawing and painting. She later studied under Assemblage artist Ron Robertson in Santa Barbara, CA. Victoria’s artwork is collected both nationally, by acclaimed gallerists and collectors, as well as internationally, with collectors in France, Spain, Germany, Hong Kong and Japan. She is currently represented by Mark Sublette’s Medicine Man Gallery in Tucson AZ and K.R. Martindale Gallery in Venice CA.